My cute friend Marianne made this cute little Christmas Banner for her Ala’Board calendar business a couple years ago. I feel in love with it and asked her if she would mind if I copied her idea but made it larger for my house, luckily she gave me the green light and I came up with this (hard to photograph) darling banner. I really do love how it turned out and get compliments on it every time someone comes in the house (unless that someone is Nate and then it took him 2 days to notice it). 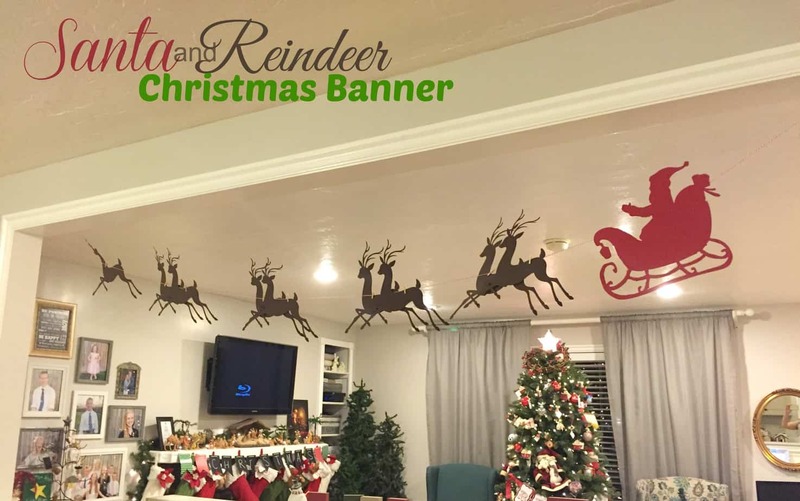 Christmas Banners are a fun (and often very simple) way to add a little something to your home (if you look closely you can see another one I have hanging on our mantle above our stockings). The project was fairly simple if you know your way around a Cricut. I used the Cricut Explore which worked well for me because I didn’t have a cut file for a Santa in a sleigh. The reindeer comes from the Winter Wonderland cartridge and is called Elegant Christmas Reindeer. The sleigh was an image I found online that I was able to import and clean up to use (huge perk of the Explore). I cut out 9 reindeer, 2 sleighs, and 2 red noses (in our house it isn’t a complete scene without Rudolph leading the way). I used 3D dots to attach the 2 sleighs together and to pair up the reindeer and then used red and white bakers twine to hang them. The darling tiny clothespins I found to use for my Christmas card display are sure coming in handy all over the place, I used them to attach the reindeer to the twine. Thanks for stopping by. I hope if you make a Christmas Banner like this you’ll share it with us! Hello I love your banner and would love to try it. What size did you make it and how did you get it so big? I used a 12×12 sheet of cardstock for each piece except Santa and his sleigh, I used 2 pieces of 12×12 cardstock for that one. Each reindeer is cut from a 12×12 piece of paper and then I staggered them like most depictions of Santa and his sleigh seem to show them. Rudolph is one 12×12 with a red nose on either side. I did it all this way so that the banner looks good from both sides. If you’re having it hang flat against a wall you wouldn’t need 2 Santa’s or two noses. Hope that helps!